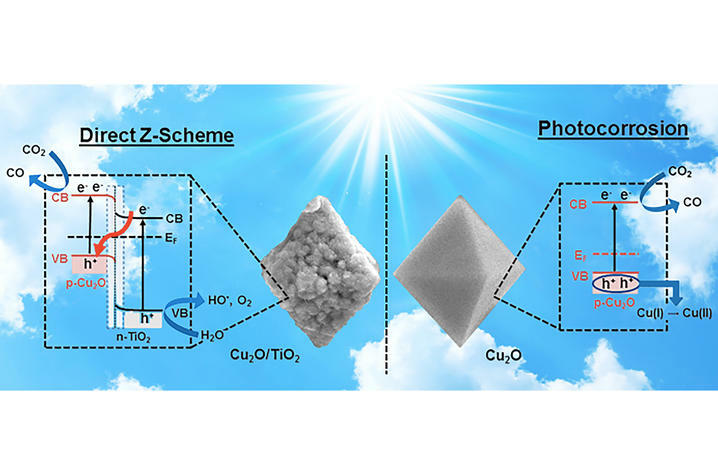 Cu2O (right) that gets photocorrosion compared to Cu2O/TiO2 (left) that operates under a Z-scheme to reduce CO2. Artwork by Ruixin Zhou, UK doctoral student of chemistry. The team designed a series of experiments to test the hypothesis that the catalyst operates through a Z-scheme instead of using a double-charge transfer mechanism. The measured carbon monoxide (CO) production from CO2 reduction, the identification of hydroxyl radical (HO•) intermediate from H2O oxidation en route to form oxygen (O2), and the characterized electronic and optical properties of the catalyst and individual components verified the proposed Z-scheme was operational.